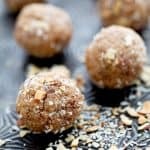 These paleo energy balls made with almond butter and dates have saved my life last month while following a strict paleo diet. Not only do they make a great snack (or I’ve even had them at breakfast too) but they have 100% helped satisfy my sweet tooth! They’re free of grains, dairy or refined sweeteners. Plus with the addition of collagen protein, they also have a nice little boost of protein. Reflecting back on last month, I have to say transitioning to eating paleo for a whole month was both hard and easy at the same time. The easy part for me was coming up with paleo recipes to make. When you think about it, paleo cooking is as basic as it gets. It’s a lot of simple ingredients (meats, fish, poultry, veggies, fruits, eggs, nuts and seeds.) So dinner often looked something like just tossing a bowl of root veggies with herbs, salt and avocado oil and roasting them. Plus a pan of roasted chicken thighs and a green salad with a paleo friendly dressing. Nothing fancy, but pretty much delicious! I made paleo shepherd’s pie a few times (rave reviews on that) and meatloaf without any breadcrumbs. But what I am saying is, there is no lack of paleo recipes to choose from! Also on the easy list was feeling satisfied. I did not have any problems feeling hungry. Using intuitive eating, I was able to listen to my hunger, and eat enough to satisfy. My weight has remained steady. I did find that a bigger than normal breakfast really helped me not turn into an afternoon snack monster. 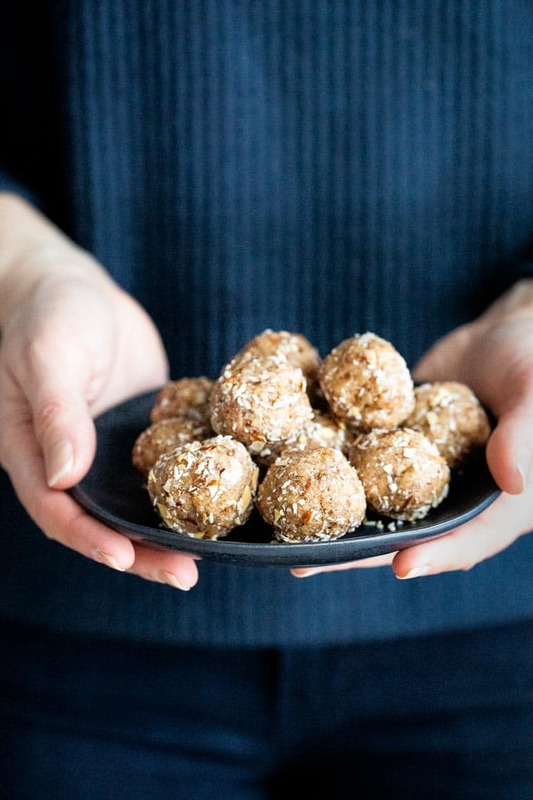 I also found that having a tin of almonds, a banana or some of these paleo energy bites handy was a good way to make sure I had something paleo-friendly if hunger struck when I was out and about. 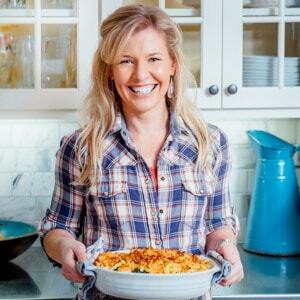 On the “hard” side of the equation, eating paleo meant that I spend more time in the kitchen. On the paleo diet, pretty much everything is made from scratch. And without dairy or grains, I had to spend time making alternatives. For example, when I made cauliflower mashed potatoes, instead of splashing in some yogurt, butter or buttermilk, I had to take the time to make a batch of cashew cream. The difference was subtle, but the number of dirty dishes in the sink don’t lie! Another challenge while cooking and eating a paleo diet for the month of January, was produce management! This was a bigger issue than I thought it would be. Usually when I plan our meals, we have a protein, a veggie and a grain. But with paleo, we’d have a protein and two veggies. Often more! So we basically had double the veggies on hand at all times. Plus instead of snacking on crackers and such, we filled the counter with fresh fruit. All of that produce takes up a lot of grocery cart and fridge space! That’s not something I could have anticipated and was an eye opener. Budget wise, I was really worried that paleo was going to be way more expensive than our already high grocery bill, but I found that it actually all worked out. I tried to stick with less expensive cuts of meat (slow cooking roasts and braising meats and ground meats.) The real reason it wasn’t more expensive is because instead of buying expensive convenience breakfasts and snacks, I was making them from scratch. Plus every day, I made two extra servings for dinner so Jase and I had a lunch as well. That means no lunch trips to Panera for Jase, and we stayed on track. The last thing I would say was satisfying my sweet cravings. I am not a huge sweet person, but after lunch I do like to have a cup of tea and a little something sweet. I found myself digging into the dried fruit on multiple occasions! That’s how I got turned on to these Paleo Energy Balls. They are naturally sweet and paleo approved because they do not have any refined sugar, dairy or grains. Dates: I like to use Medjool Dates to make these energy bites. They are very soft so the break into a smoother paste very easily. I find the dates that come pre-chopped and coated in starch are too hard. Plus, I’ve been keeping a package of Medjools on hand for simple snacking anyway. Make sure you keep them in the fridge. They have a higher moisture content and will start to go bad if left at room temperature for a long time. Remove the papery blossom end of the date if it is still attached. That’s where it was attached to the date palm, and it looks like a little brown disk attached to the flatter end of the date. Then slice lengthwise until your knife hits the pit. Pry the date open and take the pit out. To make sure the dates don’t get stuck in your food processor, cut them into a couple pieces. Blast the date pieces in the food processor with almond flour and coconut flour. I added these to add bulk to the energy balls. The coconut flour is very absorbent, so make sure you only add 2 tablespoons! The flours will help keep the dates from clumping together too much so you can add the remaining ingredients and they will disperse evenly. Next add in the almond butter. Look for almond butter that is made with almonds and salt only. The kind with palm shortening is too solid and will result in more dry energy balls. Along with the almond butter add in maple syrup and collagen protein. Collagen protein is a great way to add a little bit of needed protein to these without altering the texture or flavor. The maple syrup helps the mixture come together. Plus salt which really seals the deal why these are so delicious. Once the dough is ground up completely evenly, then check it to see if it will come together. Just pinch a little bit and if it comes together as a dough, you’re ready to rock and rollllll. As in roll the date mixture into balls. To finish them off, I made a combo of sliced almonds, salt and toasted coconut and coated the balls in it. This is not necessary, but I like texture it adds. Note: if the mixture doesn’t stick, you can roll the balls in a tiny bit of maple syrup to first. To store these snack bites, stack them in a small resealable container. I like to use glass snap top containers so the food doesn’t come in contact with plastic. They will keep for up to five days. Ours never lasted longer than that because we loved them so much! 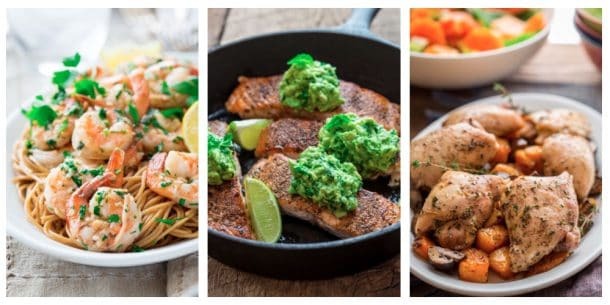 What are your challenges with eating paleo? What has been easy about eating paleo? 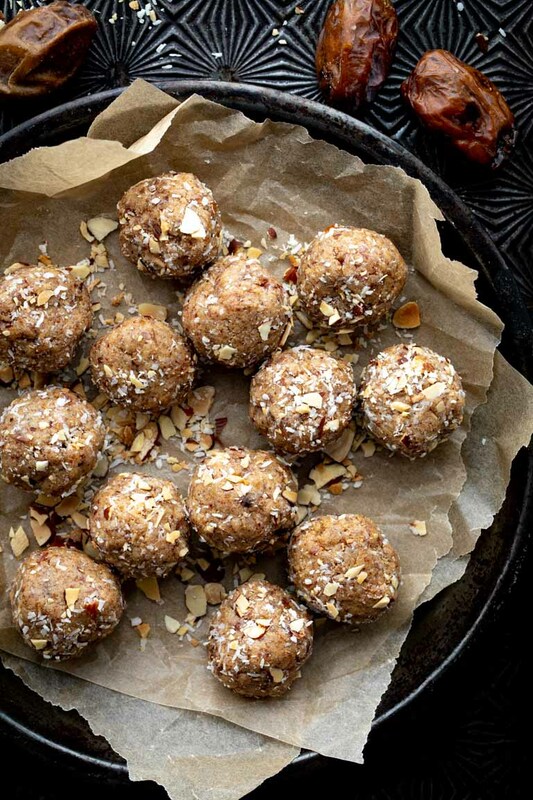 These paleo energy balls have saved my life last month while following a strict paleo diet. Not only do they make a great snack (or I’ve even had them at breakfast too) but they have 100% helped satisfy my sweet tooth! They’re free of grains, dairy or refined sweeteners. Plus with the addition of collagen protein, they also have a nice little boost of protein. Combine sliced almonds, toasted coconut and ¼ teaspoon salt in a shallow dish. Set aside. Place dates, almond flour and coconut flour in a food processor, and pulse to chop. Add almond butter, collagen, maple syrup and the remaining ¼ teaspoon salt. Process, scraping sides as necessary, until the mixture is evenly ground. Check to see if the mixture will come together by squeezing a bit of the dough. If it doesn’t, add one to two more teaspoons maple syrup and pulse again. Form into 12 balls. Roll balls in the almond and coconut mixture. If mixture doesn’t stick, add first roll the batch of balls in a bowl with a tiny bit of maple syrup to lightly coat them. Then roll in the mixture. Store in a glass storage container and refrigerate up to 5 days. I love this idea! Whenever I do a Whole 30 I always crave something sweet, and this would be perfect! How yummy these little snacks look and best of all is that are energy balls. Full of good ingredients and so tasty. I need to make these snacks this week. These look delicious! I may have to take a closer look at Paleo! It’s working for me right now while I get it figured out. This is such a fun snack recipe!! So perfect on a busy day when I need something to grab on the way out the door! Hi Liz! That’s just what they’re perfect for. We’ve been so happy to have them on hand. These are just the motivation I need to get through my workout. Yum! Ah yes! A little recovery snack is always a good motivator! Ha ha. Awesome! Let me know if you try them Raia! I’m always on the hunt for a new energy ball recipe! Thanks for sharing your paleo January experience too! Hi Danisse. Thanks so much for saying so. I was worried it would not be met with as much openness as it has been. I love all things with dates!!! 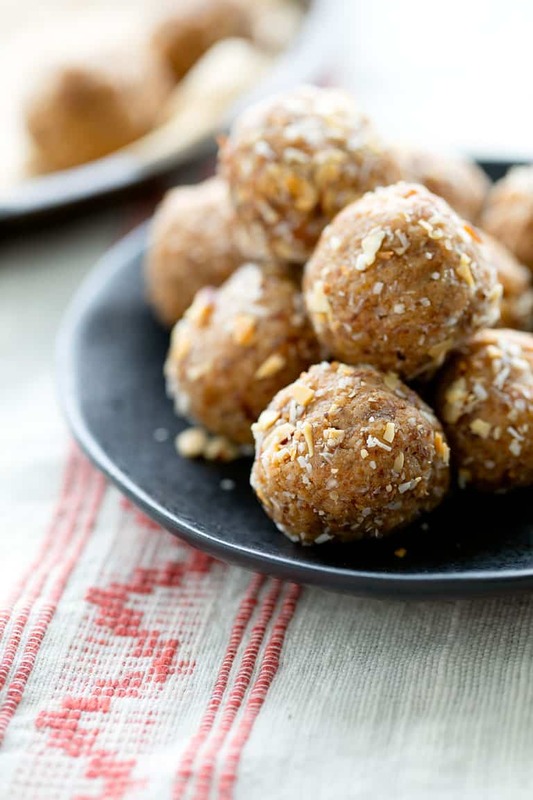 These energy balls look so yummy! Thank you for sharing! We’ve been loving the dates while eating paleo. They’re so sweet! Energy Balls are so good! I love that they are easy to make and super healthy! Delicious! Hi Shanika. Thanks so much for coming by! Enjoy them. Loved the addition of collagen to these balls. Don’t know why I haven’t done that before. I’ve added protein powder but never thought of adding the collagen one. And with the nut butter, these are lovely and protein-rich, perfect for after a workout. Thanks for sharing. We’re eating dairy free right now so collagen has been a good option for us. Normally I use whey protein. This is just the kind of healthy sweet treat recipe I was looking for! Love the addition of collagen too! So glad you discovered them. Enjoy! Yum, love these kinds of snack! Thank you very much Tessa. Let me know if you try them! These almond protein bites look delicious! What a perfect snack or after school treat! I had to hide them from my kids or they would have polished them off! Oh yum, these looks scrumptious! Such a great afternoon pick-me-up. Hi Jean. Thanks so much for dropping by today. Have a great week. Yummy — love the collagen and dates! My kids will love these! My kids do love them! I had to tell them to leave some for me! These look like a perfect sweet treat with very simple & wholesome ingredients! So glad you found them Stacey. We have been loving having them on hand! These look like the perfect healthy snack! Love the added collagen! Collagen has been a great new ingredient for me since going Paleo. I haven’t had any trouble digesting it, and I love the neutral flavor. Such a great lunchbox snack for the school week! Thanks! Speaking of lunchboxes. I should teach my kids how to make these so they can pack them for lunch! Simple, healthy, and totally delicious! I love making energy balls as part of meal prep because they’re so handy! These look so good and I definitely need to start adding in collagen! Hi Laura. Thanks! Let me know when you try it! Have a great week. These are great to have on hand! I love the addition of collagen. LOVE making ‘no cook’ energy balls! This looks delicious! Thanks for explaining paleo process. It’s been a learning experience for us! Glad to share as I go.